Representations of military power have captivated artists and audiences since the beginning of civilization. One of the greatest examples from the ancient world is the Stele of Victory of Naram-Sin, a slab of limestone two metres tall sculpted in the 22nd century BCE. Imagery carved in the stele shows Akkadian soldiers marching in formation up a mountain toward their king Naram-Sin who stands near the mountain’s summit menacing an enemy soldier after his conquest of a rival city-state in what is now western Iran. A magnificent monument with the same intention is the famous Arch of Titus found along Rome’s Via Sacra, built shortly after the Roman Emperor Titus’s death by his successor (and brother) Domitian. It was the primary commemoration of Titus’s conquest of Jerusalem in 80 CE. The creative artistry of the monument is found in carved reliefs on its inner walls. One carving shows Titus driving a chariot behind powerful horses with the goddess Roma, protector of the city of Rome, in flight. Another depicts a military procession returning to Rome from Jerusalem carrying precious artifacts plundered from the Jewish Temple. Both sculptures announce Rome’s answer to a troublesome rebellion in the province of Judea. Both pay homage to conquest and spoils after a king’s triumph, and like Naram-Sin’s commemorative stele, the Arch tells its audience of a god-king that military victory brought into being. Representations of military power in ancient history take a similar form. They speak of the greatness and immense power of the dynastic leaders who commissioned them. Rarely do they urge audiences to question those who hold military supremacy. In modern European artworks, especially paintings of the last two centuries, artists sometimes enjoyed the freedom to oppose military power. Their creations are among the most moving visual representations in all of history. Two works executed by the Spanish painter Francisco Goya in 1814 demonstrate war’s horror in a manner that moves away from glorification of military power. 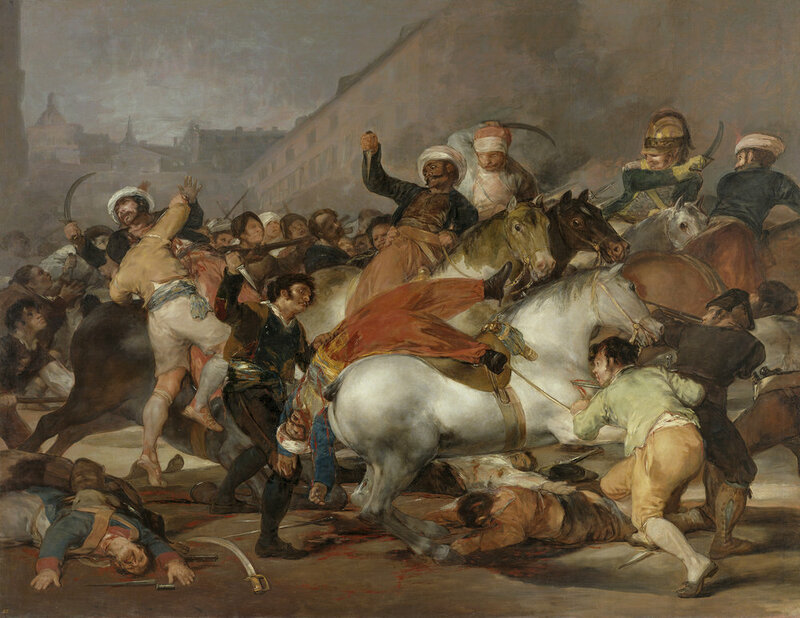 Each portrays the popular revolt in Madrid against Napoleon’s occupation of Spain before the Peninsular War of 1807-1814. In Goya’s Second of May 1808, we see the ferocious confusion of battle as Mameluke cavalry under the authority of the Napoleon’s army charge against crudely equipped Madrid citizens. The Spanish partisans struggle against mounted troops with little more than simple daggers and we see them fight with intensity and passion. In Goya’s Third of May 1808, we encounter a drama of unusual intimacy. Men are gathered in the early morning following the uprising; some are Napoleon’s soldiers, others await execution. It seems in a moment we will witness the killing of a Spanish partisan who now stands in front of a bright lantern, the only illumination in the scene. The man’s arms are raised in a gesture we might interpret as defiance or perhaps a last-second plea. A groundbreaking work of art in several ways, Third of May defies easy explanation. Goya certainly conjures in his audience the sympathy that would be felt by any human witness. We see no glorification of a majestic king and no attempt to cleanse blood and gore with soldiers’ glory. These paintings were produced in European societies that enabled artists to express their ideas. We detect in their works of art an attitude to military power that differs from the glorifications of ancient monumental sculpture. One has to look thoughtfully in order to grasp these expressions of dissent, for these painters were susceptible to social influence even if their expressive freedom was greater than those who came before. To empathize with the central characters the viewer must find a language of her own. That is why Goya’s Third of May is the most powerful and famous of the two paintings. Who would refuse to identify with the man who faces the cold-blooded firing squad?